Our cross partition rings of chemical porcelain are four cell and are used to support the packing saddles above the support beams or self-supporting dome. These rings are 6″ diameter (152 mm) by 6″ high (152 mm). For shipment, these rings are packed in cardboard cartons with 8 pieces per carton. 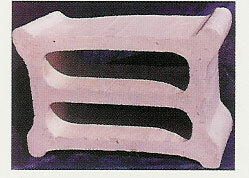 APT grid blocks of chemical porcelain are two cell and used to support the packing saddles above the support bars. 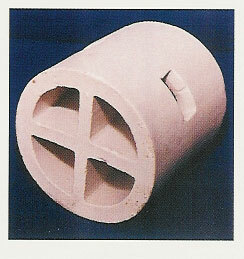 These blocks are 8-1/2″ long X 5-3/4″ wide X 3-1/2″ high (216 mm X 146 mm X 89mm). For shipment, these blocks are packed in cardboard cartons with 4 pieces per carton.